This is a narrative of Part 2 of my recent trip through Iceland (if you’ve arrived on this page first, for chronology and continuity please first read Part 1). In Part 1, I wrote about our journey to the beaches, cliffs and waterfalls of Southern Iceland. As we worked our way away from the southern coast and into the interior of the country, we left the lowlands behind and climbed into the highlands (for a detailed map, please scroll to the end of this post), the weather kept getting colder and snow replaced rain. 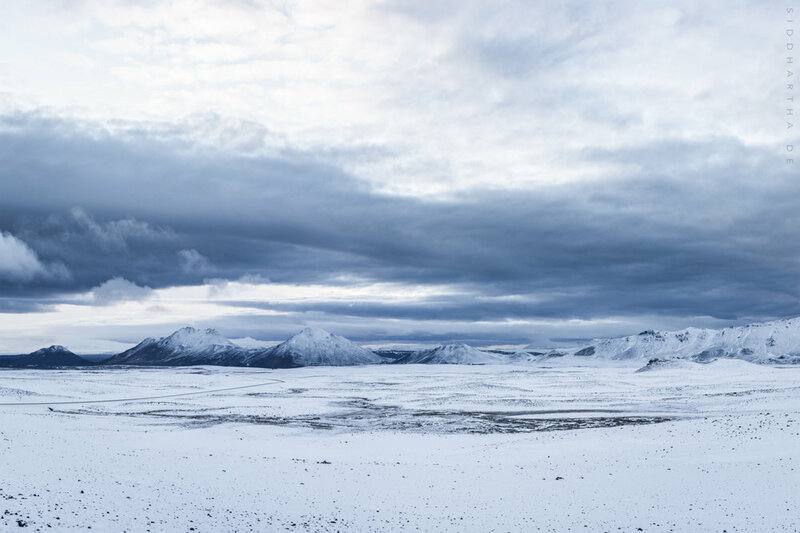 In a matter of hours, the colours changed from the yellows and browns of the autumn grass and the blacks of the volcanic sand beaches to the snowy whites and subtle blues of the snow-capped mountains. We timed our trip to Iceland to get the best of daytime and nighttime photography. Gorgeous landscapes and seascapes during the day, and hopefully the aurora borealis at night. The northern lights eluded us for most of the trip, but at our next stop at Lake Mývatn they gave us a brief glimpse of a sight that those of us who live in the tropics don't get to witness. It was brief, but mesmerisingly beautiful. The following day, we visited the world-famous Godafoss and the lesser-known Aldeyjarfoss. While I’ve photographed these waterfalls before, especially a spectacular sunset at Godafoss, seeing these falls in snowbound conditions was a unique experience. We were rewarded with some glorious sunrise shots at Mývatn too. I was doubly satisfied since Mývatn was not a place I had stopped at on my previous visit to the country. We continued on towards Laugarbakki, with a stop at Akureyri along the way for a little street photography and lunch. Akureyri is a pretty town sitting at the end of a beautiful fjord, and the approach into town is quite dramatic as you drive down the mountainside along the fjord and over a causeway across the water with the fjord on your right and the airport on your left. Unfortunately, the streets of Akureyri didn’t see much photography on account of the steady rain, but lunch was good. Thus replenished, we drove to Laugarbakki while the weather kept getting steadily worse. No northern lights. We took a detour to the troll rock at Hvítserkur the following morning, but without any real expectation of any worthwhile photography. It was a difficult trek down to the beach in snow and slush, and in cold, grey and windy conditions. The tide was coming in and it wasn't the most enjoyable experience. 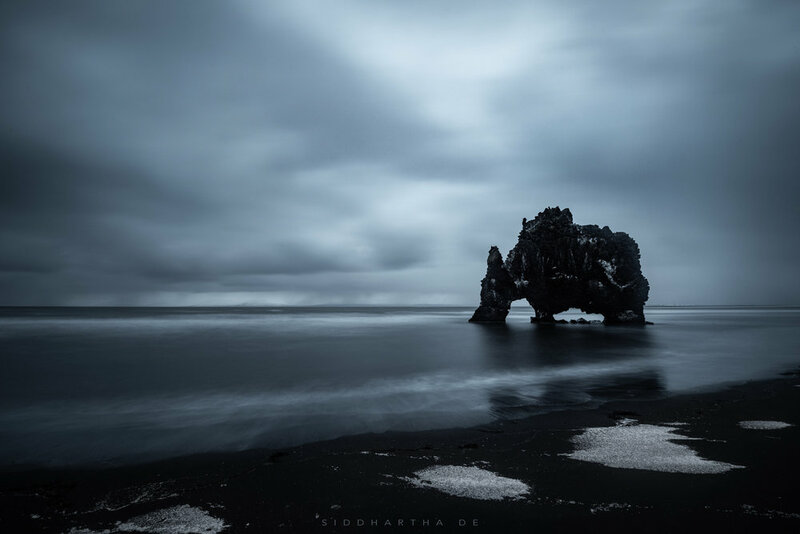 I couldn't shoot Hvítserkur the last time I was here because then the weather had been even worse, and so I decided to make the most of the conditions I had this time. Our stop at Hvítserkur brought us to the end of our journey through Northern Iceland. I had dearly wanted to visit the Westfjords this time, but couldn’t do it. They will have to wait until my next trip. So we headed west and south towards the Snaefellsnes Peninsula, towards Kirkjufell, probably the most photographed location in Iceland. We didn’t have much of a sunset, so we took a few shots and returned to our hotel for dinner. At night, the skies cleared and there was a good chance of seeing the northern lights again. We did in fact see a fairly clear band across the sky near our hotel, but by the time we got to Kirkjufell, the lights had all but faded. Still, Kirkjufell never disappoints, and always offers photographic opportunities to those who seek them. We went back early the following morning to try and catch our last few shots before heading back to Reykjavík, and home thereafter. After our night shoot, the clouds had rolled in and sugarcoated the area with a fine dusting of snow. The early morning light made the scene that much more beautiful, reminding me once again that good things come to those who wait. The sun started to rise and the overnight blues and greys started to change to softer, warmer shades, colours that were simply breathtaking. And as the sun peeked in and out of the clouds and painted the sky in its ridiculous reds and golds, I understood that Iceland has given me more than I had initially hoped. I came, the hungry photographer, in search of beautiful landscapes and seascapes, pictures to add to my growing portfolio. But after having waded into the ice-cold waters of the North Atlantic, or felt the stinging bite of sleet on my face, or battled winds that threatened to blow me off a cliff, or stood in a cathedral of mountain and waterfall and cloud and sky, I realised that what I got (not instead, but in addition) was a sense of peace, tranquility and contentment, an enhanced appreciation of this beautiful country, a connection with the world around me, a counterweight to the stresses and troubles in my life. And so my second sojourn through this magical land comes to a bittersweet end. Iceland has a certain intangible quality, a way of touching something in you. It claims a part of you, it leaves a mark, and you don’t fully appreciate what it is until you go back. Then, all at once, that dormant part of you comes alive again, charging you up, leading you on. Wherever I am, whatever I do, it will continue to reach out to me, always drawing me back to the land of fire and ice.